Tiffany Haddish stepped out yesterday evening(September 24th) for the premiere of her new film 'Night School' at the Regal L.A. Live theater in LA. 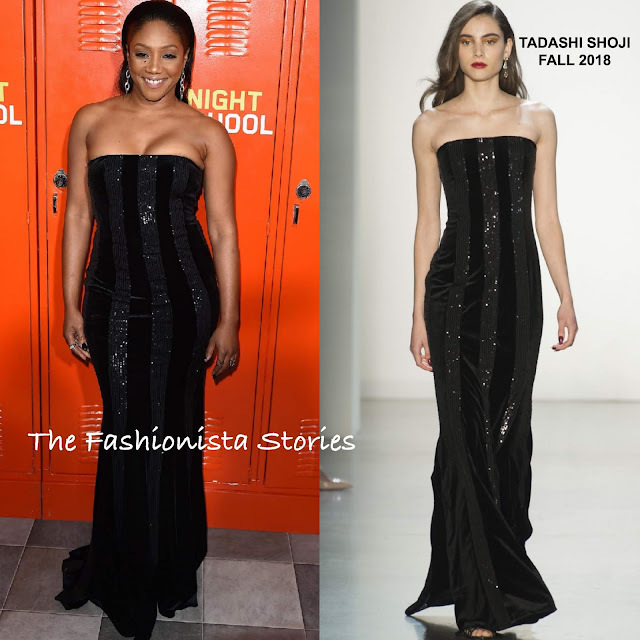 For the occasion, she turned to TADASHI SHOJI, wearing a FALL 2018 black strapless sequin & velvet panel column dress. Although this is not as fun as some of the pieces that she has been wearing, she does look great. However I find the dress to be a bit tight on the bust. She finished up her look with statement jewelry, pulled back tresses and minimal makeup.